Electric 308 GTS: Blasphemy or genius? The Ferrari 308 GTS was restored, revived and electrified by Electric GT, an electric car conversion company based in San Diego. The electrified Ferrari features three 75kW electric motors with a total driveshaft output of 447Nm. Drive is sent to the rear wheels via a five-speed Porsche G50 manual transmission that’s been mounted upside down and backwards. In terms output, the electric 308 is up considerably on the 1978 US-market 308 GTS, which had a carbureted 2.9-litre V8 rated at 177kW of power and 243Nm of torque. Supplying the motors is a 28.5kWh lithium-ion battery pack that’s claimed to have a driving range of around 130km. The Electric GT team is reportedly working on a more powerful 75kWh option that will give the 308 GTE a range of about 320km. Despite the fact that the restored Ferrari is carrying around a heavy battery pack, the 308 GTE weighs just 1520 kilograms, or around 46kg more than the original 308 GTS. The 308 GTE rides on refurbished 18-inch BBS forged alloy wheels, and is said to have a top speed of 251km/h. No performance numbers have been quoted for the 0-100km/h standards. 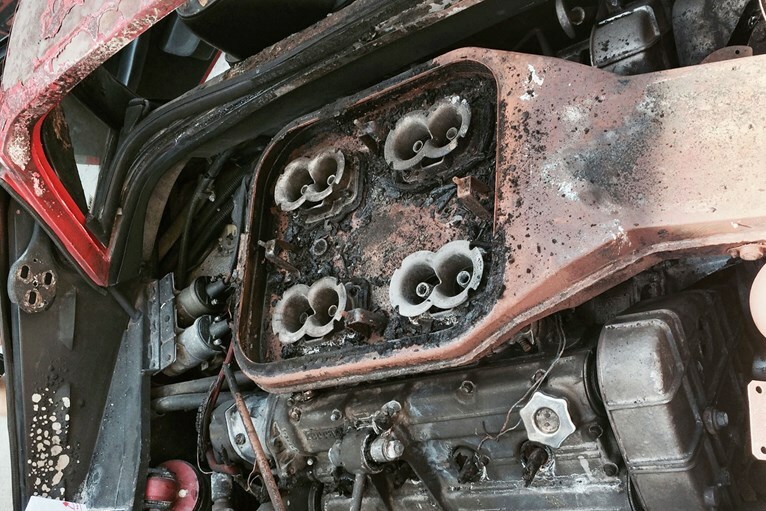 The original Ferrari 308 GTS that served as the basis for this first 308 GTE was, according to Autoblog, bought for NZ$13,000 after leaking fuel caused a fire that ruined the engine and electrical systems beyond repair. During the restoration process, the 308 GTS was stripped back to the chassis, and original parts that weren’t required for the 308 GTE were given over to other 308-related projects around the world. The 308 GTE will compete at this year’s Re-Fuel Electric Car Race on May 22 at Laguna Seca.